Lorna Schultz Nicholson's The Next Ones: Hockey's Future Stars is a glossy, colorful, photo-laden look at the top players in junior hockey, specifically those who have had some connection with the Canadian national team at some level. The book is somewhat geared towards younger readers, as that is Schultz-Nicholson's area of expertise. But that should not discourage interested older readers. This book should be considered by junior hockey fans of all ages; Canadian hockey fans looking for more information on players soon to be named for the popular World Junior Championships; and NHL fans looking to learn more about their favorite team's top draft choices. One of my favorite parts of this book is the Q&A inserts for each player. These rapid fire fun questions about favorite superheroes and rock bands somehow humanizes these hockey players that we will undoubtedly end up treating as bigger than life all too soon. The book is written in cooperation with Hockey Canada, which should be no surprise as Lorna Schultz Nicholson is married to Hockey Canada president Bob Nicholson. Ever wondered who the next big hockey star was going to be? 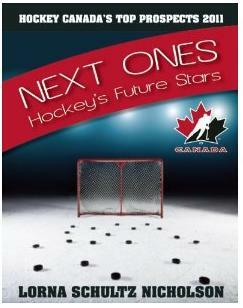 With Hockey Canada’s annual comprehensive guide to the best of the best in the junior hockey world, you can find out. Not only for hockey fans, but for coaches and scouts alike, this guide includes photos, stats, personal information, players’ ambitions, plans, and dreams. Based on junior hockey performance and expected success in the pros, The Next Ones presents the top twenty-five Canadian prospects as decided by Hockey Canada. This book will give readers the whole picture and maybe even a glimpse into those who might become the next Great One. Lorna Schultz Nicholson is a hockey insider, from minor hockey to the Olympic games. She travels extensively to cheer on Canada, whenever and wherever our men and women compete, including the 2002 and 2006 Winter Olympics. She has been at the juniors and the worlds, and enjoys the friendships she has made with the players and their families. Lorna and her husband Bob live in Calgary, Alberta. They have three wonderful children together, Mandi, Marijean, and Grant.